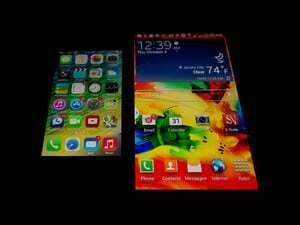 The iPhone 5s and Samsung Galaxy Note 3 are monsters. They are capable of extraordinary performances which is not in small measure due to their excellent components and software. There are a lot of things that the two phones have in common but there are at least as many things different between the two of them. So let’s compare these two excellent smartphones and see which one of them has the edge over the other? Actually, does one really have the edge over the other? 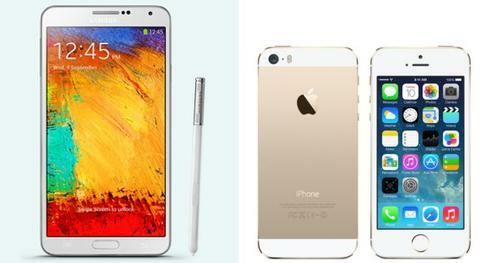 Both the iPhone 5 and the Samsung Galaxy Note 3 have wonderful designs. But while one of them is drastically different from what any of us knew or would have expected the other is not as big a change. The Samsung Galaxy Note 3 now features a fake leather back (yes, fake, sorry) which comes equipped with (also fake) stitching to give it a soft feeling. The purpose is to take away the feeling of cheapness that you might have gotten from the past plastic housing. Quite a different approach if you look at the Samsung Galaxy S4. There are three different types of colors for the phones: Jet Black, Classic White and Blush Pink. The iPhone 5s, as you might have expected, does not have such a different design from past models. It keep its sleek design and it keeps its aluminium housing but it is now available in three colors: Space Gray, Gold and Silver. Both phones have great designs but we have to give credit to Samsung for trying something new and giving the Galaxy Note 3 an improved look. 151.2mm x 79.2mm x 8.33mm. 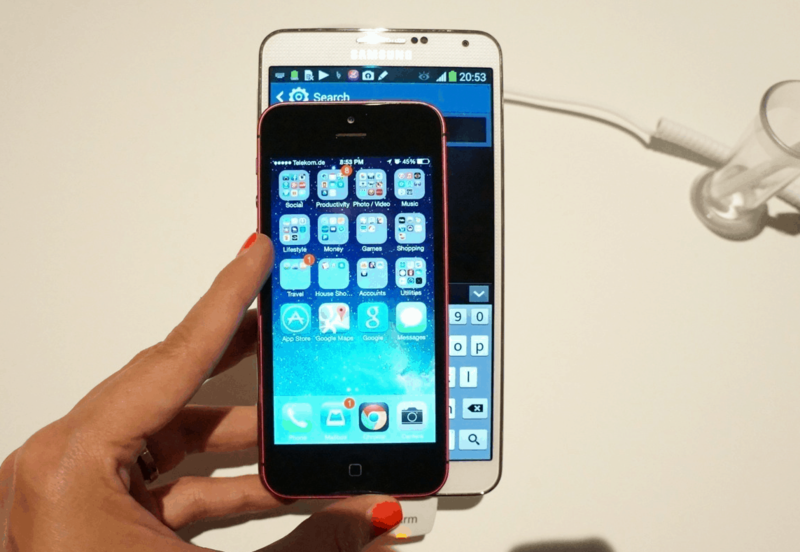 These are the sizes of the Galaxy Note 3. Furthermore, it weighs about 168 g. It is not quite heavy if you take into consideration its dimensions. It’s ultimately a question of taste (and logic if you ask us). You don’t buy such a huge phone and then complain about its size. If you prefer something more accessible and easily operable , then 123.8mm x 58.6mm x 7.6mm iPhone 5s might be what you are looking for. 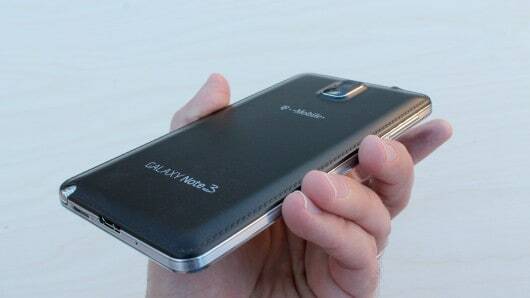 It is also significantly lighter than the Galaxy Note 3, weighing at about 112 grams. So if size is not a must for you then you should probably go with the 5s. This is one of those ares where the Galaxy Note 3 wipes the floor with the iPhone 5s. It possesses a superb 5.7 inch 1080p Super AMOLED screen which offers unrivaled quality in terms of images. With its 388 pixels-per-inch it surpasses the iPhone 5s by far and is an overall delight for your eyes. The iPhone 5s boasts a screen with the resolution of 1,136 by 640 pixels, which would mean roughly 326 pixels-per-inch. There are people for whom this wouldn’t seem such a big problem, this screen being almost just as capable of offering sharp images. If screen resolution means a lot to you, then the Galaxy Note 3 is the obvious change. So let’s talk about processors. Snapdragon 800 versus the A7. Pretty heavily contested match here. There are so many things to focus on. The A7 GPU is stronger than the Snapdragon 800 GPU. 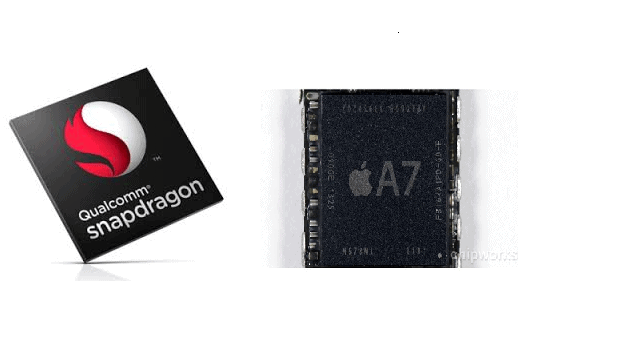 The Snapdragon CPU is stronger than the A7 CPU. The A7 indeed has better single thread ability but the S800 uses more higher clocked cores in order to catch up. It is quite difficult a winner here. So we’re gonna go ahead and declare (being totally unbiased) the Snapdragon 800 the winner. When it comes to storage, the iPhone has 3 variants: 16, 32 or 64 GB. There are no SD slots, however. The Galaxy Note 3 has 32 Gb and it boasts a microSD card slot, supporting up to 64 GB. Samsung’s flagship phone is also rigged with 3 GB of Ram, compared to the single GB of RAM that the iPhone 5s has. So this category has to go to Samsung, having arguably better hardware in it. The Galaxy Note 3 is hooked with a 3200Ah battery. The iPhone 5s is hooked with a 1570Ah one. Presumably based on personally testing both of the phones, some websites have stated that there is a significant difference in favor of Samsung. 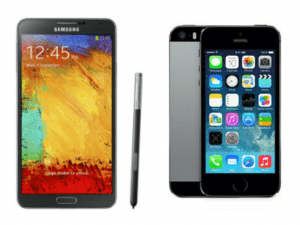 The Galaxy Note 3 allegedly lasts 24 hours before it needs to be recharged whereas the iPhone 5s only lasts 10. The Galaxy Note 3 comes with the S Pen which is awesome and has incredible functionality. Its handwriting recognition ability is also unrivaled and is able to recognize even the sloppiest of writings. This is a fact. The iPhone 5s on the other hand comes with the Touch ID fingerprint sensor, allowing you to buy from the App Store and unlock your phone. The iPhone 5s comes equipped with the iOS 7 which is the latest operating system from Apple. 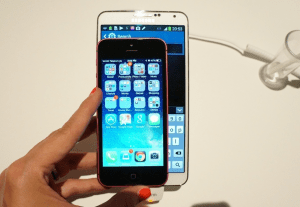 The Galaxy Note 3 comes with Android Jelly Bean 4.3 which is not. The plus and minuses are the same as always: stability on one hand, customization capability on the other, etc. The iPhone, with a 2 year contract in the US, ranges from $199 to $399, depending on storage capacity. The Galaxy Note 3 ranges from1 $199 to $299. So Galaxy Note 3 would seem to be more advantageous economically. It comes down to what you want, ultimately. If you want a smaller good looking phone capable of good performances yo should chose the iPhone. If you want something bigger, with a better screen , longer battery life and highly customizable then go with the Samsung Galaxy Note 3. We know we would. What would you choose ?